A healthy life style means that you have proper well balanced food, do exercise regularly and have enough sleep at fixed time. Having junk foods and sleeping late at night are not part of a healthy life style. Fruits are always said to be good for your health. They are full of vitamins, minerals and other nutrients required for the body. Among many of the fruits, watermelon has an important role in providing you nutrients needed by your body. About 97% of watermelon consists of water. So it is the right food for those who want to lose weight. During summer if you consume watermelon, you can prevent dehydration of the body and remain energetic. It is the ideal fruit to quench your thirst in summer. Dietary fiber is also found in high quantities in this fruit, which makes it an excellent fruit for improving your digestive functions. It also contains natural sugars and therefore excellent for people suffering from diabetes. 100 gm of watermelon contains 7 gm of sugar and 32 calories. Other essential nutrients found in watermelon are Vitamin C, Vitamins B1 and B6, beta-carotene, lycopene, potassium and magnesium. Lycopene is an antioxidant. This is responsible for the red color in watermelon. Lycopene makes the cell membrane strong and healthy. It allows good nutrients to in to the cells and eliminates unwanted elements from the cells. It can also prevent many types of cancer. Being low in calories, watermelon makes your stomach full but provides very little calories. So you can have it without the fear of gaining too much of weight. This makes it the ideal fruit for weight loss. This fruit is more common in tropical sub-climatic regions, but are also found in other parts of the globe. Since it is not very expensive, all can have it without spending too much of money. How Watermelon Diet Helps you to Lose Weight? If you want to lose weight effectively and remain healthy and fit, watermelon diet is the perfect diet for you. When the doctor prescribes this diet for you, you may be confused as to how to follow a watermelon diet. So here is a guide on how to follow watermelon diet. When you have watermelon diet, you have to have this fruit throughout the day. For breakfast and dinner also you must have this fruit. Watermelon diet is usually recommended for those who want to lose weight fast. You may also have this diet if you want to remove toxins, excess salt, water and other unwanted elements from the body and cleanse your body. You must be careful about the amount of watermelon you consume as you have to follow this diet for five to 7 days. The quantity of watermelon you should eat depends on your weight. It is in the ratio 1:10. If your body weight is 60 kg, then you can consume 6 kg of watermelon at night. When you are on this diet, you must take care not to undergo any vigorous activities as it provides less calories and your body itself is undergoing some workouts of its own. If you have any liver or kidney problems, watermelon diet is an ideal diet for you. This is because this fruit helps in eliminating all toxins from the kidneys and provides you a strong and healthy kidney. If you find it too boring to follow the same diet for days, you can make it more tasty and interesting by adding some other healthy ingredients to it. For example, you can make a salad with watermelon by adding cucumber and kiwi to it. Similarly instead of taking it as pieces, you can make watermelon shake and have it. This makes it more tasty. Keep the watermelon in the fridge for some time and then have it. This way it becomes tastier and you will love it. How much Watermelon Should you Have a Day? 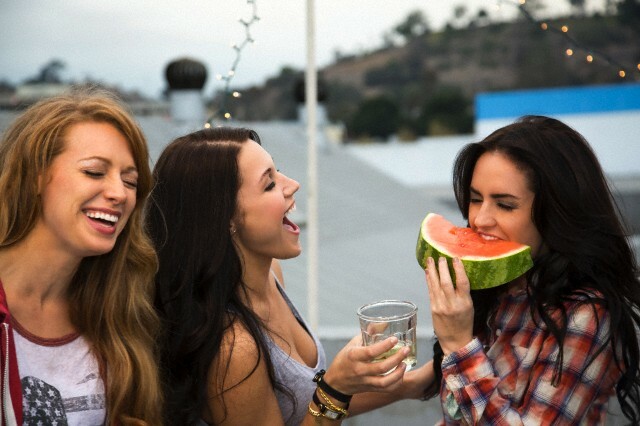 When you are on watermelon diet, make sure that you are not consuming more of the fruit than it is prescribed to you. If it is to lose weight, the amount you take depends on how much weight you intend to lose. Each serving of watermelon contains an approximate of 150 kcal. It is a must that you have eight servings per day. Since 97% of this fruits consists of water, you need not drink too much of water as you do in other diet plans. You will enough water from the fruit itself. Watermelon diet has lots of health benefits. Consuming watermelon helps in the increased production of arginine, which is an amino acid found in the human body. It helps in producing nitrous oxide, which aids in relaxing the blood vessels. It is also good for preventing heart attacks and strokes. It is also said that watermelon diet helps in increasing the fertility capacity in men. This is because it increases the movement of the sperm through the female reproductive tract and thus makes fertilization of egg faster. Moreover, watermelon diet helps in flushing out toxins from the kidney and the bladder. This way it prevents infections from attacking the body. Watermelon also has great healing power due to the presence of citrulline, which is an amino acid found in watermelon. So try out watermelon diet and see how it makes you healthy physically as well as mentally. Mix watermelon and lemonade in a blender and make a puree. You can strain it if you wish so. Add mint leaves and serve cold by adding ice cubes. To make a cocktail, you can add tequila or vodka before you serve. How to Lose Weight Fast with Aerobics Exercises? Watermelon is actually a paleo diet which works great for weight loss. You have done a marvelous job on describing the benefits. My family and I went paleo about four months ago, and I have to say, not only is it fantastic for weight loss, but it’s amazing for overall health.